Here are some questions you might have about kayaking or Stand Up Paddling. If you don’t see the answer to your questions please give us a call so we can answer all your questions. What about capsizing the kayak? Capsizes are extremely rare. All of our trips take place in stable, traditional, two-person sea kayaks (larger and steadier than river kayaks). The popular image of kayaks bobbing through rapids, and flipping upside-down is common to river kayaking but not ocean kayaking. Keep in mind, however, if you participate in our skills courses, you will be learning and practicing rescue techniques that require overturning your boat. No. Sea kayaking is highly accessible. Our friendly, supportive staff will teach you the simple, necessary skills you need in order to enjoy your time on the water. Only if you so choose. Ocean kayaks glide easily, with little physical effort. Sea Trek trips are designed so that participant don’t over exert themselves; and travel is at a leisurely pace. Will I be safe?Yes. For precautionary purposes all our clients wear a lifejacket (or PFD personal flotation device). For all trips and classes you will be accompanied by an instructor/guide who is trained in first aid. Sea Trek has an unblemished safety record. Will I need any special gear or equipment? Sea Trek provides all your basic kayaking or stand up paddling gear such as boat or paddleboard, paddles, and lifejackets. Wetsuits are provided for certain classes/trips. Please select the “What To Bring” tab above to see a list of suggested clothing and items to bring. Yes. Children of any age can kayak together with an adult, depending on the skill and confidence of the adult. Sea Trek offers programs (trips and camps) specifically designed for kids. What does it cost to rent a kayak? $25/ hour for Single Kayak or Stand Up Paddle Board and $40/ hour for a double kayak. What do people enjoy about sea kayaking? Sea kayaking is a means to explore and enjoy the outdoors on an intimate level. There is the solitude of a solo paddle, or the thrill and camaraderie of a group adventure or a Sea Trek trip or class. Kayaking also provides great exercise gentle, or energetic at your own pace. We’re delighted you’ve chosen to join us. Sea Trek has a reputation for making kayaking and Stand Up paddling fun and approachable, and we try hard to anticipate your needs. Here are suggestions for clothing and other items you should bring. Please don’t hesitate to call us or to ask your guide or instructor when you arrive about what you have brought and what would be best to use. Wear something that’s comfortable. Ideally you’ll be wearing tops and bottoms made out of quick dry materials (polyproplene, capilene, lycra). Cotton when wet stays wet and thus keeps you colder. The time of day and season will determine whether to wear long sleeve or short sleeve tops and shorts or long pants (windbreaker style, running tights etc.). Feel free to bring a few choices as we have storage shelves for any extra gear. Know that we have windbreakers (nylon non-breathable shells), neoprene jackets, nylon windbreaker style pants and wetsuits here at Sea Trek for your use whether you are renting or taking a guided trip or class. No extra charge. A lightweight pair of gloves (paddling or biking gloves work well) is a good idea to protect your hands against potential blistering from the paddle if you are kayaking. Not necessary for Stand Up paddling unless you want additional warmth or sun protection. Sunhats with a good retention strap are excellent ideas for sunny days. For evening trips, especially during the cooler months it’s a good idea to bring a warm hat (ski hat) that can cover your ears, an extra layer such as a fleece top, and gloves to keep your hands warm. Please note that for instructional classes and certain guided tours we outfit you in our wetsuits. 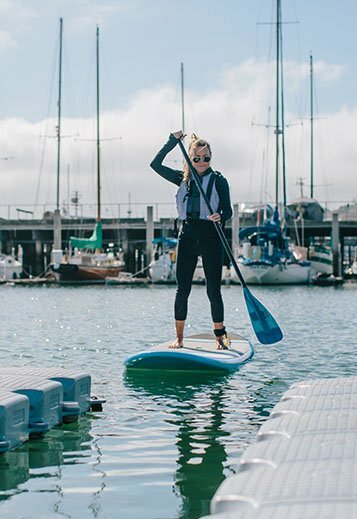 For example: Intro Sea Kayaking Class, SUP Intro Class, Advanced Paddle Class, Angel Islands Skills Class, Paddle The Gate, Angel Island Crossing, Coastal Paddle, SUP the Golden Gate. When renting kayaks and Stand Up boards we launch and land from our specially designed floating dock. Your feet will stay dry and you have the option of going barefoot on the paddleboards and sit-on-top kayaks. Other appropriate footwear could be booties, water shoes, teva-type sandals or old sneakers. Flip flops are not a great option. If it’s a cooler time of year wear wool or synthetic socks that keep your feet warmer even if they get a bit wet. If you are taking a guided kayak tour or class you should wear footwear: booties, water shoes, teva-type sandals or old sneakers. If it’s a cooler time of year wear wool or synthetic socks that keep your feet warmer even if they get a bit wet. Consider bringing an extra change of clothing and footwear for a more comfortable ride home.